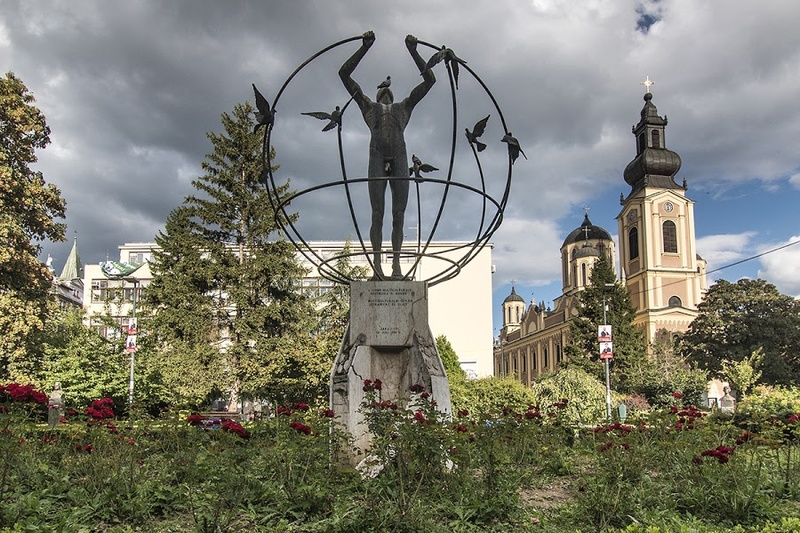 The sculpture sits on Trg Oslobođenje – Libertion Square – in the center of Sarajevo. It consists of a naked male figure reaching toward the sky, pulling the meridians of the earth together. Around him, doves help by lifting further meridians into place. The inscription reads, “Multikulturalni covjek izgradjivace svijet” (Multicultural man builds the world.) The Siege of Sarajevo was the longest of a capital city in the history of modern warfare, lasting from 5 April 1992 to 29 February 1996 (1,425 days.) A total of 13,952 people were killed during the siege, including 5,434 civilians. The work of Italian Francesco Perilli, this is one of four identical monuments: the first was installed in Toronto in 1985, the second here in Sarajevo in 1997, followed by Changchun (China) in 2002, and then East London (South Africa) in 2006. A fifth was planned, such that each continent would possess a Multicultural Man, but the sculpture planned for Whittlesea (Australia) was never realized due to lack of funding.